This is a shot of the Plaza Hotel at the end of Fremont Street from under the Freemont Street Experience Canopy - a spectacular light show that runs nightly from dark until about midnight. 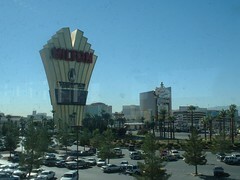 Downtown Las Vegas is a very different experience from the more trafficked Las Vegas Strip hotels. Downtown the hotels are not the mega-resorts, rather they offer far more modest surroundings and casinos. The advantage is generally much cheaper rates for rooms that are usually fine, and the intrigue of the original Las Vegas venue which is an area of several square blocks bordered on one end by the Plaza Hotel. 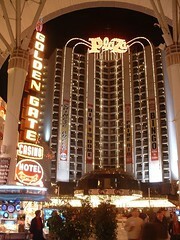 Unlike the strip, you can visit several casinos in a short time here but don't expect the same level of glamour. The Las Vegas Hilton is a nice hotel, but does not offer the splendor of the Bellagio, Wynn, or new Palazzo. Notable for the off-strip location right next to the Las Vegas Convention Center, the Star Trek Experience attraction - a high immersion interactive space adventure , and Barry Manilow's regular performances. When booking the Hilton pay close attention to offers from hotel consolidators who often have rooms at less than the Hilton Website.